For those people that know me, they know that I am a huge fan of the Edmonton Oilers. 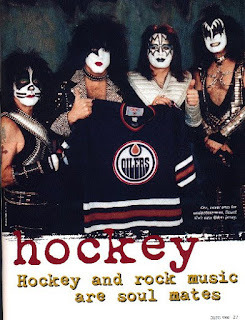 Ever since I was a little kid, I used to love watching the Oilers play hockey. Five years into their NHL existence they won hockey's greatest prize, the Stanley Cup. As an Oilers fan I've seen it all. I was there when Wayne Gretzky was trade (or sold depending on who you ask), I was there for the five Stanley Cup wins, I was there for the lean seasons of the 90's after the team could not afford to keep their nest players. I was there in 2006 when the Oilers fell to the Hurricane in Game 7 of the Stanley Cup Finals (I still am not sleeping right since then..) I was there last year when the Oilers traded heart and soul winger Ryan Smyth... that was a tough one. As I watch the games I am very critical of the team. While they have always been entertaining, they have not been an elite team for quite some while. there have been some interesting transactions over the years... I still have no idea why GM Kevin Lowe traded Chris Pronger to a team in the same conference. I have no idea why coach Craig McTavish continued to play goalie Dwayne Roloson so much early in the season when it is clear that Mathieu Garon was the goalie for this team. Garon has quietly had a tremendous year, just look at his Shoot Out record. He is unbeaten. My wife (who would have to be considered a Calgary Flames fan... ugh) has become very knowledgeable about the Oilers. Dare I say that she has become an Oilers fan as well? The reason for this post is to communicate the fact about how time changes everything. Last year at this time the Oilers had traded Smyth and suffered their worst collection of games ever winning only twice (or something like that) in their last 20 games. This year the Oilers are making an incredible run for the playoffs as they site 5 points out of the final playoff spot with multiple games against the three teams that they are trying to catch. Oh man it's been fun. Tonight is the biggest game of the year as the Oilers battle the Vancouver Canucks. It's going to be intense. This weekend I am taking my family to Edmonton for some family fun as we visit the world's largest mall, West Edmonton Mall. On Saturday afternoon I get to attend my first Oilers game in Edmonton in over 10 years as they face Ryan Smyth's new team, the Colorado Avalanche. I cannot wait. The Edmonton Oilers are a great example of an entertaining sports franchise that care about their fans. Go Oilers Go.... what a difference a year makes in the life of a sports franchise. We'll see you at the game on Saturday.